Background: Signal transduction is a process where a chemical or physical signal is transmitted from extracellular to the intracellular nuclear matrix as a series of molecular events, most commonly protein phosphorylation which ultimately result in a response. At the molecular level, such responses include changes in the transcription or translation of genes, and posttranslational and conformational changes in proteins, as well as changes in their location. These molecular events are the basic mechanisms of controlling cell growth, proliferation, metabolism and many other processes. In multi-cellular organisms, signal transduction pathways evolve to regulate cell communication in various ways. One of the important signal transduction occurs through JAK-STAT and NF-κB regulated Pim-1 kinase expression. Methods: Major pathways such as JAK-STAT and NF-κB signaling are involved as the targets of Pim-1 kinase activities including cell cycle progression, mitotic cell division, oncogenic transcription, apoptosis and metastatic invasion. There are three target points in JAK –STAT systems including the inhibition of activated JAK via phosphorylation, STAT –STAT dimerization and the entry of activated STAT components for nuclear binding. NF-κB signaling is regulated by IKK enzyme proteasomal degradation and translocation of activated NF-κB complex into nuclear domain for DNA transcription and cellular expression. A number of inhibitors were designed to inhibit these major drug target points of activated JAK-STAT and NF-kB signaling cascades. Results: Pim denotes Proviral insertion in murine. It was reported that a wide range of human cancers including bladder cancer, colorectal cancer, head and neck cancer and hematological malignancies such as leukemia and lymphomas form due to over-expression of PIM1 via JAK-STAT and NF-κB signaling cascades. An attempt has been made in the present review to focus various potent inhibitors for the inhibition of JAK-STAT and NF-κB signaling targets. These inhibitors are in clinical trials or to be progressed in the clinical investigation. Conclusion: Incorrect regulation of cytokine-mediated activation of JAK-STAT and NF-κB produces abnormal expression of Pim -1 kinase and solid cancer. Phosphorylated JAKs can induce transcription of target genes and NF-κB acts as a regulator of a gene that can control cell proliferation and cell survival. Therefore, JAK-STAT and NF- κB regulated Pim-1 kinase is a novel target for anticancer leads and these leads can be used to design a template as an anticancer agent. Further clinical studies can be carried out to discover new novel congeneric entities. Keywords: Signal Transduction, Pim-1 Kinase, JAK, STAT3/5, NF-κB, Novel cancer targets, JAK-STAT inhibitors, NF-κB inhibitors. 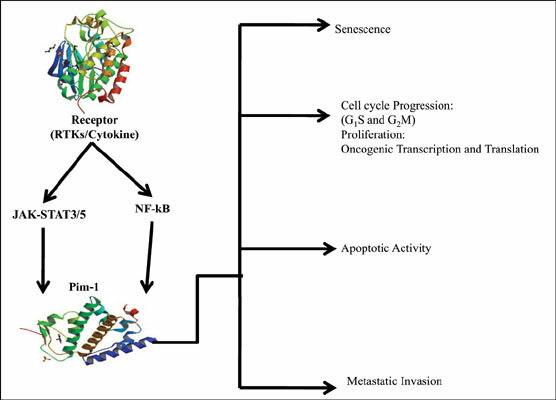 Keywords:Signal Transduction, Pim-1 Kinase, JAK, STAT3/5, NF-κB, Novel cancer targets, JAK-STAT inhibitors, NF-κB inhibitors. Abstract:Background: Signal transduction is a process where a chemical or physical signal is transmitted from extracellular to the intracellular nuclear matrix as a series of molecular events, most commonly protein phosphorylation which ultimately result in a response. At the molecular level, such responses include changes in the transcription or translation of genes, and posttranslational and conformational changes in proteins, as well as changes in their location. These molecular events are the basic mechanisms of controlling cell growth, proliferation, metabolism and many other processes. In multi-cellular organisms, signal transduction pathways evolve to regulate cell communication in various ways. One of the important signal transduction occurs through JAK-STAT and NF-κB regulated Pim-1 kinase expression.